With Christmas and New Year behind us it is time to start cooking and eating light. Fish and rice fit the bill very nicely. All I did was steamed the rice in a rice cooker, sautéed the cod in a teaspoon of butter and tablespoon of olive oil. At same time in another frying pan I quickly sautéed julienned red pepper and zucchini and sliced sweet onion. 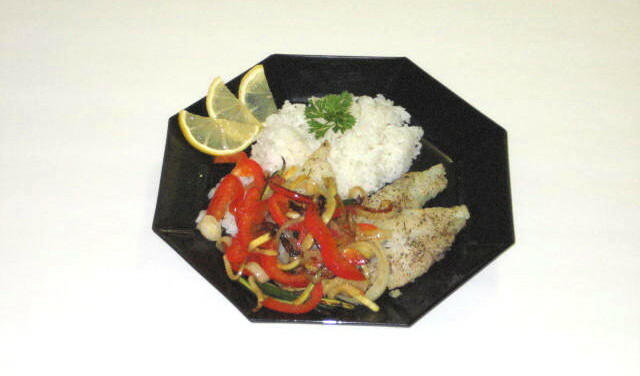 The cod and veggies were done at the same time, about 5 – 7 minutes. I served thinly sliced cucumber in honey and rice vinegar dressing on side. Definitely goes on a repeat list.